This luxurious Apartment has 2 bedrooms, 2 bathrooms and enough sleeping arrangements for up to 6 guests to spread out comfortably throughout an impressive 130 square meter of living space, making it an ideal accommodation choice for a family or a group of close friends looking for the ultimate holiday experience. You will feel right at home the moment you step inside the Apartment's contemporary interior design. Bedrooms have sliding doors that lead to the Balcony Deck. Bathrooms are fitted out with plush towels and start up supply of soaps and toiletries. There is a fully equipped modern kitchen for the discerning cook including a double door fridge, freezer, dishwasher, oven, microwave, toaster and tea/coffee making facilities (initial supply of coffee, tea, milk, sugar are provided). The apartment has a washing machine and dryer should you decide to stay longer, but if washing is not your thing - there are also laundry mats and dry cleaning services nearby. Our welcoming Apartment has everything you will need for a comfortable stay, including a complimentary use of unlimited Wifi to make sure that you are always in touch with the rest of the world. It has 3 heatpumps (2 in each bedroom and 1 in the lounge) to ensure you are comfortable in the hot Auckland summer or in the cooler winter. A 55" Flat Screen Television and a DVD player sure to appease your entertainment needs during your holiday. The apartment is serviced every week. 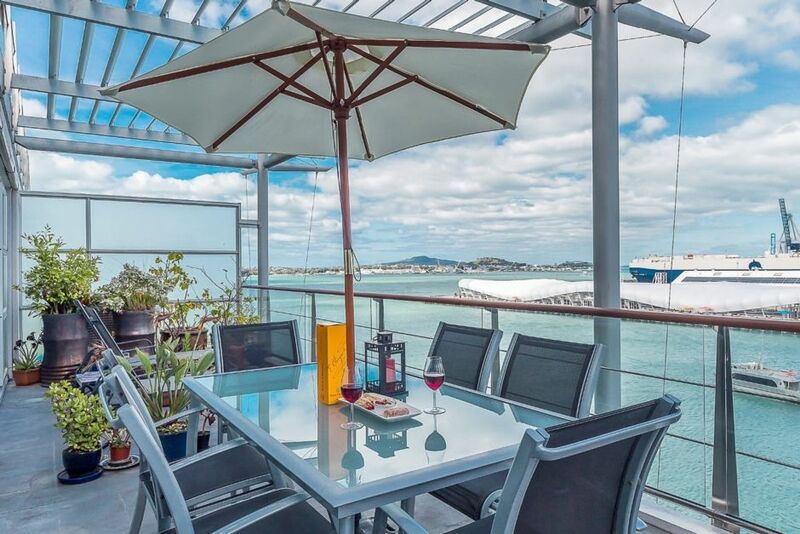 Transport to/from the apartment is easy whether your stay in Auckland is for business or pleasure, the Prince’s Wharf Deluxe Waterfront Apartment will suit your accommodation needs. It has 24hour security. The apartment is set-up to be a practical alternative solution to an Auckland CBD hotel accommodation and suits singles, couples or small families. We are the proud WINNER of the 2015 Golden Piwa Bach of the Year (Best City Category) Award - voted by our numerous guests who were pampered during their stay. A copy of government issued ID or passport needs to be supplied. Check in time is 4:00pm and check out time is 12:00 noon. As this is a privately owned apartment and there is no reception on site. Check in/out procedures will be emailed upon payment in full of the total cost of accommodation. Free internet WIFI, available onsite secured carpark for 1 car for $25/night . The condo was in a beautiful location in the harbor! Close to shops, pubs and restaurants. Only concern we had was on the last day when a cruise ship was moored right outside our window. This is very nice apartment with a terrific view from the balcony of the ferry Barbour. Easily accommodates four adults . Location is excellent...close enough to restaurants and pubs; but far away enough not to be noisy! Owner was very helpful and was very responsive. Being right on the water, the view is amazing. Sitting on the large patio you have a birds eye view of the ferries, cruise ships and city. You are walking distance to great restaurants and tourist activities. Be aware that you may wake up and have a cruise ship right outside your window, that traffic can get crazy outside the complex and the ferries start honking their horns around 7:00 am. Also check for extra towels and/or laundry soap if you wish to do your own. Great property and location right in the heart of the harbour. If you like watching watercraft, cruise ships etc. this is your apartment. Very close to hundreds of pubs and restaurants.